Discover the Myth and Legend surrounding the Giant’s Causeway and historic Letterkenny with a fantastic trip to uncover their secrets! Join us as we wind our way along the top of Ireland and through the rugged Antrim countryside, before exploring Giant’s Causeway. Marvel at the 40,000 symmetrical columns, said to have been built by the Giant Finn McCool, so that his Scottish Lover could cross the sea. If that’s not enough of an adventure, explore fascinating Letterkenny with its classic pubs and gothic architecture! 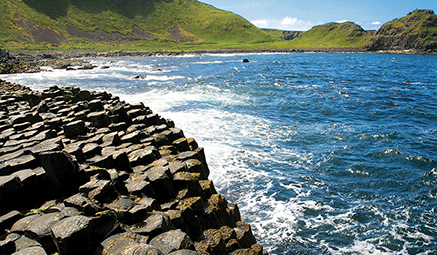 Giant’s Causeway - Full Day - fall in love with the Causeway coastline, jewel of Northern Ireland, where dramatic rocks meet the moody Atlantic Ocean and myth and legend is everywhere. Journeying along the coastline, we’ll stop first at the clifftop ruins of Dunluce Castle, before heading on to the Giant’s Causeway and Causeway Centre (entry included). Mystery surrounds the 40,000 symmetrical columns which, it is said, were built by the Irish Giant, Finn McCool, so his Scottish lover could walk across the sea to him! Letterkenny - Full Day - to this delightful town nestled on a hillside atop of the beautiful River Swilly. 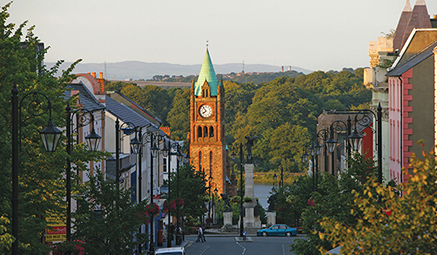 There’s plenty to do in Letterkenny, with a main street that’s one of the longest in Ireland boasting an abundance of quaint shops, great restaurants and classic pubs. You could wander one of the many museums and heritage sites, or take a peek at the impressive modern cathedral, built in Gothic style. Inishowen Peninsula & Londonderry - Full Day - to one of north west Ireland’s most beautiful locations with stunning coastlines and spectacular views. Exploring the dramatic coastline, where plunging cliffs meet gently sweeping hills and breathtaking valleys. We’ll take a peek at Malin Head, before heading into the fascinating city of Londonderry.